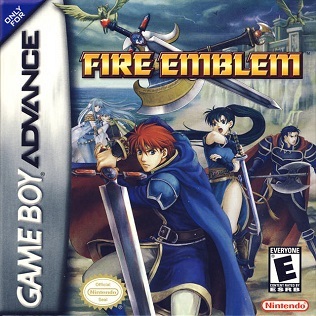 I have recently been playing Fire Emblem for the GBA. This is the first game in the series I have actually played, and while I heard it was good, I was never sure how good. It’s no Final Fantasy Tactics, but it holds its own quite well, and is definitely a worthy addition to any turn-based strategy lovers’ collection. Fire Emblem is split up into two parts: Talking and Fighting. Every battle, or fighting segment is broken up with a bit of talking. The talkey parts are your average fair. They’re nothing more than cutscenes of user controlled scrolling text and un-animated images moving around the screen in accompaniment with the text. When I say un-animated, I mean the images themselves have no animations, but they do move about the screen, mimicking animation. Anyhow, if you don’t care about the story at all, it’s just a waste of 2-3 minutes, but I don’t imagine many people playing this game if they didn’t care to some degree about the storyline. For those who have played Final Fantasy Tactics or other similar turn-based, strategy games, there’s nothing extremely new here. In Fire Emblem each side gets a turn. During your turn you can move each of your units and give them an order. Once an order is issued, that unit can no longer do anything else. So no guerrilla tactics by attacking then moving. This, however, can be done with the use of a bard. Bard’s allow units to perform their entire turn again. However, Fire Emblem is a very tight-knit game and rarely does the player actual use a strategy that wasn’t thought of by the designer. It is possible after level 10 to upgrade your characters to a more powerful class. However, this rarely happens. I’ve only actually upgraded one of my units once, the storyline has given me all other upgraded units. Now, aside from unit placement, Fire Emblem’s strategy comes in with the weapons. To put it simply, Fire Emblem is a grand game of Rock-Paper-Scissors. There’s three weapon types: sword, lance, and axe. 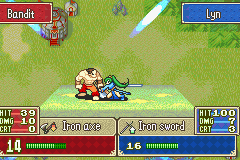 Sword beats axe, axe beats lance, lance beats sword. Simple. Similarly, there’s a triangle of spells as well: dark, light, and anima magic. This is Fire Emblem’s main gameplay mechanic. The only element of depth is buying more powerful versions of each weapon type, and if you get those stronger versions sooner, or upgrade your units, you pretty much don’t even have to follow the Rock-Paper-Scissors rule set. 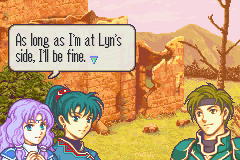 One thing Fire Emblem does to alleviate the simplicity of its combat system is that if any of your units are defeated in battle, they are gone for the entire story arc or worse, the rest of the game. So, even if you don’t lose the game, it might be useful to restart a particular battle to ensure that that unit moves on to the next battle. 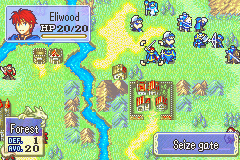 To summarize, Fire Emblem is a simple turn-based, strategy game. This makes it easy to pick up and play for players of any skill type. Simple mechanics aside, it is still quite fun. Any lover of turn-based, strategy games will have a good time with Fire Emblem. However, as stated at the beginning, it is still no Final Fantasy Tactics. If you’re looking for a game with more depth in gameplay and story, Fire Emblem is not where you’ll find it. I’m sure to some degree you will find it fun and entertaining, but it’s no Shakespeare novel. This post was published 3202 days ago, content in the post may be inaccurate, even wrong now, please take risk yourself.